Since 1998, Anita Y. Tsuchiya has written case studies, research papers, how-tos, news articles and ebooks for a variety of media outlets. She received a Bachelor of Science in animal science from the University of California, Davis and studied acupuncture at NIAOM in Seattle. Here’s a fun thought: Next time you watch the fast-paced action of a volleyball game, consider how many laws of physics are being demonstrated on the court. For example, every movement by the ball or the athletes illustrates one of Newton’s three laws of motion: inertia, acceleration and action-reaction. Applying the principles of physics to sports does more than just provide an interesting math problem. These analyses form the basis of biomechanics and sports science and can be used to improve athletic performance. Newton’s first law, also known as the law of inertia, states that unless acted upon by a force, a motionless body will stay still or a moving body will keep moving. The law of acceleration, Newton’s second law, states that an increase in the velocity of a moving object is directly proportional to the force applied and inversely proportional to the object’s mass. The third law, the law of action and reaction, states when one object exerts a force on another object, the latter object reacts with an equal force in the opposite direction. A critical component involved in these laws of motion is called force, which pulls or pushes on an object and creates movement. Force isn't directly visible but is measured by the direction and distance a moving object travels. A nice example of the law of inertia can be seen in a volleyball at the highest arc of a server’s toss, that moment when the ball is nearly motionless. It will either fall straight down due to the force of gravity, or sail across the net from the force of a hand striking it. In an example of a moving object, a spiked volleyball moves in a fairly straight line downwards unless deflected by the force of the net, receiver’s forearms, blocker’s hands or floor. 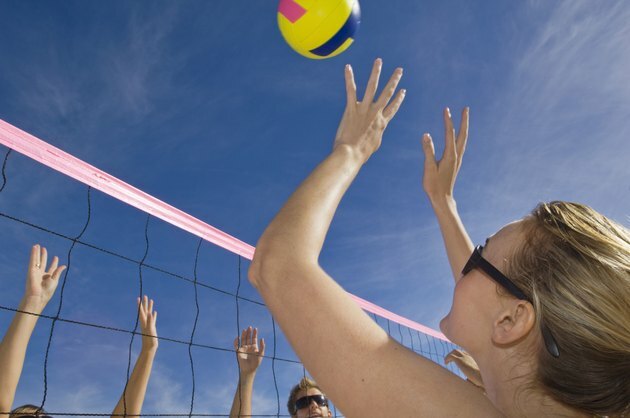 The law of acceleration comes into play every time a volleyball player moves on the court. Smaller athletes are more agile on the court because their lower mass accelerates and decelerates more quickly, which is particularly critical on defense. Heavier athletes need more time to get into position, or more leg strength to get there as quickly. The faster the arm swing, the more force is exerted on a spiked volleyball at the moment of contact. The law of opposing forces can be seen when volleyball players leap off the floor. The force exerted by their feet downwards is countered by an opposing, upwards force exerted by the floor. If the floor didn’t “push back,” athletes wouldn’t be able to leave the ground. The opposing force from the floor, by the way, is also why people get sore feet after a long practice session and bruised from hitting the floor after a hard dig. How Do the Laws of Motion Apply to Basketball? How Are Newton's Three Laws of Motion Used in Baseball?